Debbie worked as a laboratory medical technologist and always dreamed of using her skills on a hospital ship. Serving on the Africa Mercy was a way to realize those dreams. Chuck was a chemical engineer working in the photographic manufacturing industry. With a background in paper making, plastic and chemical processes, as well as packaging and logistics, he found a good fit serving in the medical supply department on board the Africa Mercy. We discovered that all kinds of skills are needed to meet the needs of people around the world. Being part of a team serving the world's forgotten poor has challenged our thinking and formed many friendships from many different countries. Check out the Mercy Ships website for more information about this wonderful organziation. I remember thinking that this was a very strange place for me to be. I was at the Hope Center, where patients recover from surgery done on the Africa Mercy, the world’s largest non-governmental hospital ship. I was helping a man from Guinea, in West Africa, make a friendship bracelet. He didn’t speak English, and I don’t speak Susu. It wasn’t that long ago that I was working in a hospital laboratory in Rochester, NY, and Chuck was working as a chemical engineer at Eastman Kodak. 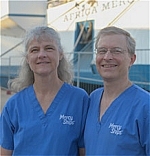 We retired early to do this work in West Africa as a part of an international community providing surgery and health care to some of the poorest people in the world. What an incredible experience it has been! We’ve seen miracles of healing, and have worked with amazing people. How did we ever get here? We started thinking about retirement a few years ago. I had heard about the organization of Mercy Ships a few years ago, and had supported their mission of helping the world’s forgotten poor. What if we could do something more than just write a check to an organization we believed in? Maybe it would be possible to do something extraordinary when we retired. It would be wonderful to be an active part of seeing lives changed. It turned out that our lives would be changed as well. We wanted to see what kind of work we could do with Mercy Ships and see if we would fit in with the organization. Our first step in the process was to travel to Texas headquarters where we could receive some training, education and interviewed with the medical placement staff. It was here that we learned the values, philosophy and met others who were also interested in volunteering with Mercy Ships. Since Debbie was a medical technologist, working in the lab was a good skill fit. My professional experience was in heavy manufacturing in the paper, plastic and chemical industry. Since I understood material flow, inventory control and logistics, working in the procurement/medical supply area seemed to be a good fit. At the end our time in Texas, we both wanted to serve with this international community, but decided that we would have to wait until retirement to allow us the amount of time we felt would be necessary to serve well. Debbie also felt she needed to change jobs to acquire more general laboratory experience. So that’s what we did. Chuck continued to work in his engineering job so that we would be ready financially for retirement, and I changed jobs to gain the experience I would need to work in the lab on the ship. It felt like a big change for us. We were still working, but we had a different goal. We were working toward an early retirement, and to an experience that would be unlike anything we had ever done. Two years later we were on a plane to Conakry, the capital of Guinea in West Africa. We felt prepared. Our house was being looked after by our wonderful neighbors, we had our many immunizations for Africa, and our two duffle bags were packed for a five month stay on board the ship, the Africa Mercy. We became part of the crew of over 400 people from more than 30 nations, all working to serve the poor of West Africa. Life is a lot different now. After our five months in Guinea, we rejoined the ship the next year for four months in the Republic of Congo. We’ve lived and worked in a culture different from our own. We have friends from around the world. We’ve seen the effects of corruption, poverty and disease unlike any in our country. We’ve also seen healing, thankfulness and joy. We are blessed. Thank you for sharing this story! My husband is a fisherman in Alaska and I am a medical technologist. We are currently praying about serving the Lord in the near future.